The trailhead for hiking to Mt. Lee and the Hollywood Sign finally reopened on Monday, January 5 (after nearly 10 months; it was supposed to be 5 weeks!). The trail is open to pedestrians 7 days a week, sunup to sundown. One, the dirt parking area at the trailhead is permanently closed and trail users need to park in the residential area about 0.15 mile south of the trailhead on Beachwood Drive. Second, the city has enacted an ordinance that forbids street parking by non-residents on weekends and holidays from 8 a.m. to 6 p.m. I will be updating my trail guide below accordingly. 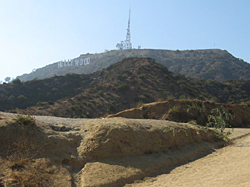 Let's hike to the Hollywood sign! One of the most iconic images on the Tinseltown landscape is the famed Hollywood sign sitting atop Mount Lee in the Hollywood Hills. 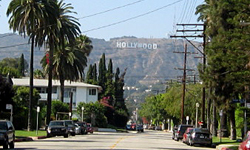 The original wood sign, erected in the early 1920s, read HOLLYWOODLAND as an advertisement for the Beachwood Canyon real estate development. Over the years the sign fell into disrepair. 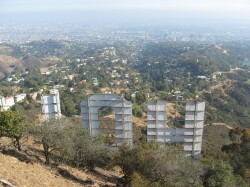 In 1978 a group of celebrities funded the restoration of the sign to its former glory, minus the "LAND." In 2010 the historic landmark once again faced harm as a developer had designs on turning the nearby hillsides into houses. But once again the sign was saved as politicians, celebrities, and common folks banned together to raise $12.5 million to purchase the adjacent 138-acre site, including neighboring Cahuenga Peak and Burnbank Peak, to forever preserve it as open space in Griffith Park. 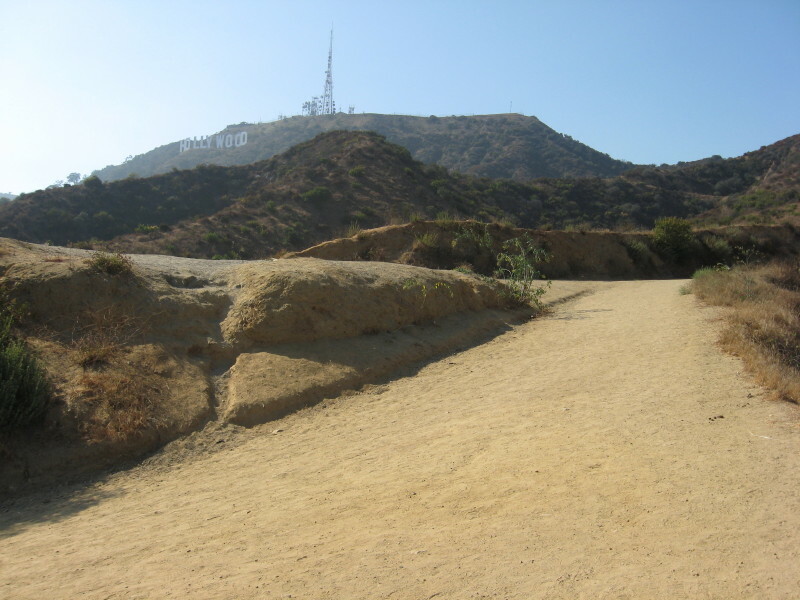 Today, this hike to the Hollywood sign on Mount Lee combines a dirt road and a paved road and climbs 550 feet in 1.5 miles. You are rewarded with spectacular views of Hollywood and the L.A. basin to the south, and the San Fernando Valley to the north. Fences, signs, and an array of high-tech security devises prohibit you from getting up close and personal with the giant landmark, but from your perch atop Mt. Lee you can look right down on the sign from 100 feet away. In Hollywood, navigate your way to the intersection of Franklin Avenue (which is one block north of Hollywood Blvd.) and Beachwood Drive (which is one block east of Gower Street and about 0.7 mile west of Western Avenue). Note that Beachwood Drive does not go through to Hollywood Blvd. From the 101 Freeway, exit at Gower. 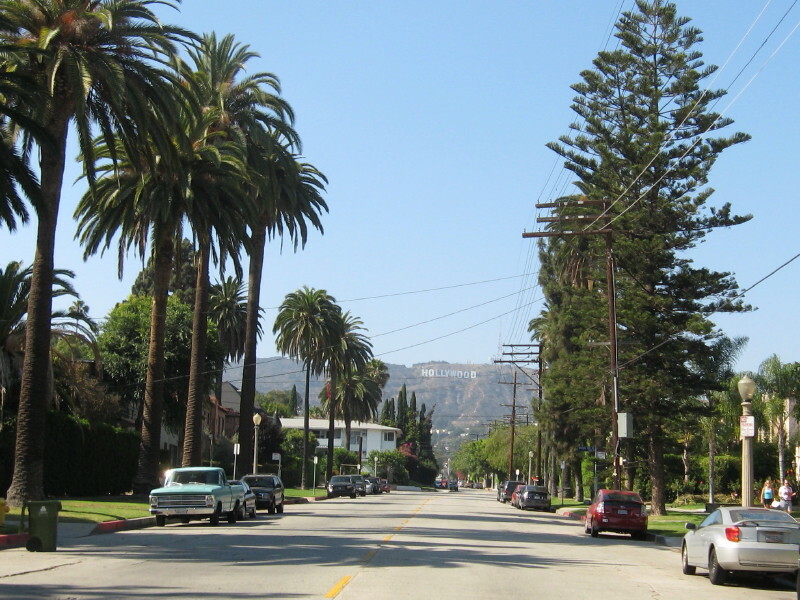 From the intersection of Franklin Avenue and Beachwood Drive, drive north on Beachwood toward the hills for 1.8 miles to a dirt parking area just short of Sunset Ranch horse stables (the address of Sunset Hollywood Ranch is 3400 N. Beachwood Drive, Los Angeles, CA 90068). (By the way, for connoisseurs of residential architecture, this drive up Beachwood Drive is a delight, offering an amazing collection of diverse architectural stylesbut keep your eyes on the road, it is narrow and winding.) 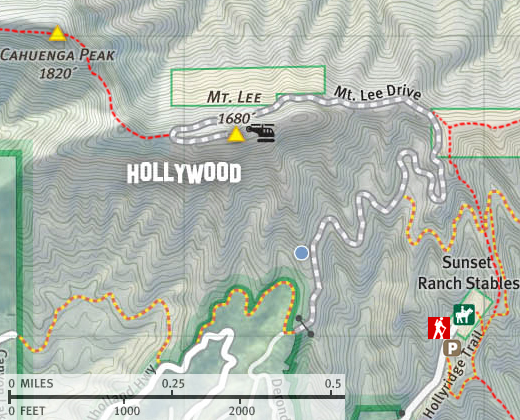 When you reach the parking area, your route is on the right and marked "Hollywood Ridge Trail." 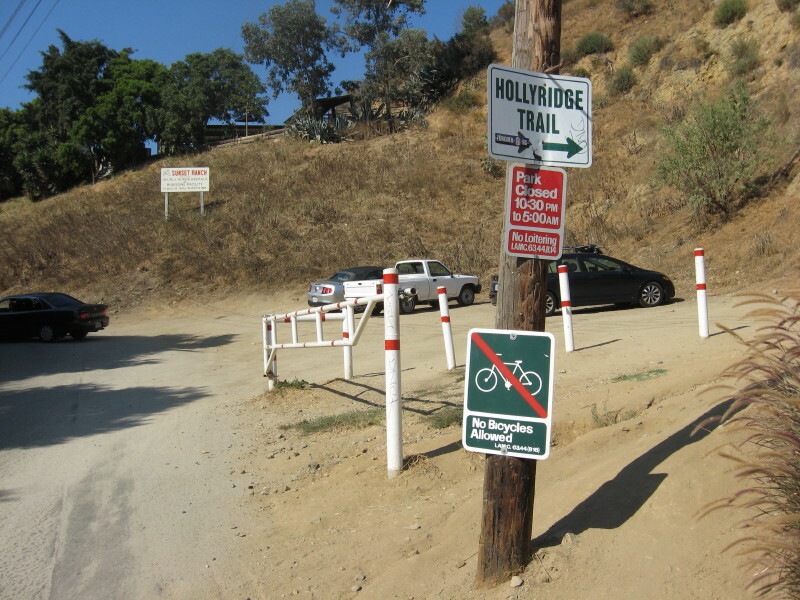 Begin your ascent on the marked "Hollyridge Trail" heading southeast. 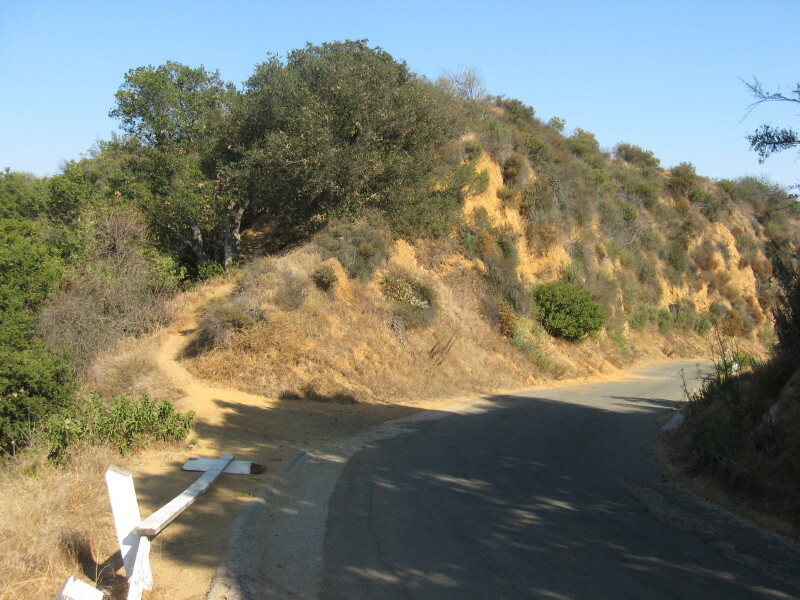 Note that in Griffith Park, "trails" generally refer to dirt roads wide enough to be a two-lane highway! Almost immediately after starting your climb look to the right (west) to get your first glimpse of the famed Hollywood sign. Your route takes a sharp turn left turn (north), passes the road coming up from the horse stables, then in a couple more minutes reaches an unmarked junction with Mulholland Trail. Take a sharp left (rather than continuing straight). 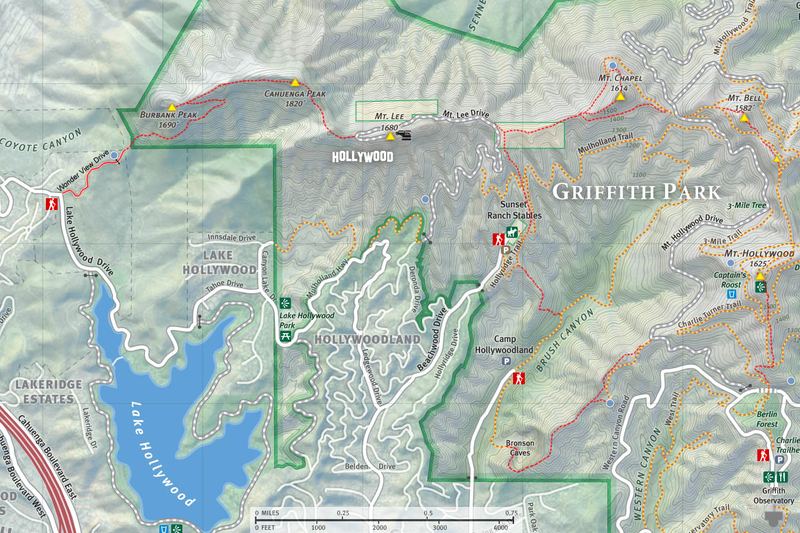 Follow the route as it contours around the slopes, and in a few more minutes you will arrive at a paved road, Mt. Lee Drive (there is a locked gate at the bottom, so don't entertain the idea of driving to the top). Turn right (north) and proceed up the windy, paved road. After a steady climb you reach the ridge top with views north toward Forest Lawn, downtown Burbank, and the San Fernando Valley. And the San Gabriel Mountains beckon you to them for a real hike. This is good spot to catch your breath. Notice on the right a narrow path heading east into the brush. This trail takes you to Mt. Chapel and connects with other park trails. But for our hike to Mt. Lee, bear left (west) on the road. The road traverses the north slopes of Mt. Lee and offers great views of the San Fernando Valley. You'll pass below the communications equipment on top of Mt. Lee to your left and shortly reach a hairpin turn crossing over to the south slope of the mountain. 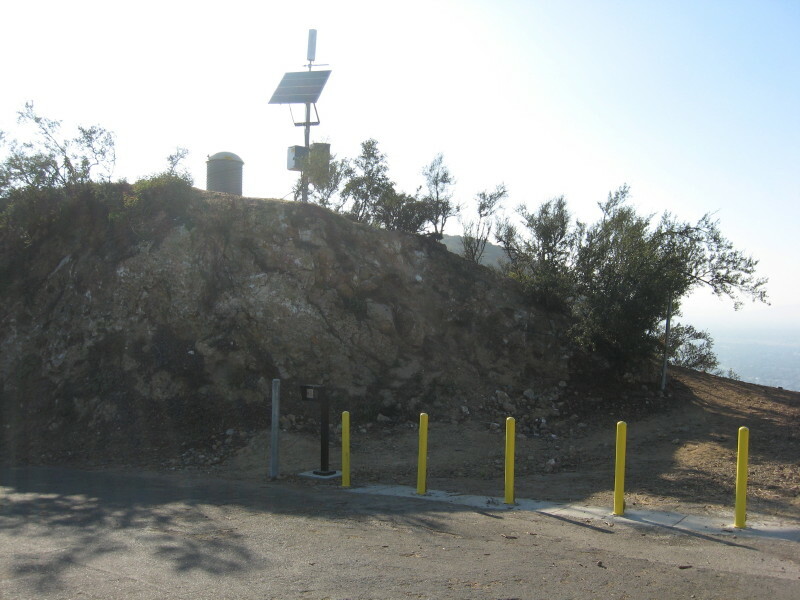 At this hairpin stands a monument commemorating the addition of Cahuenga Peak to Griffith Park (dedicated on March 22, 2012 / Read story). Notice a path to the left of the monument heading east. 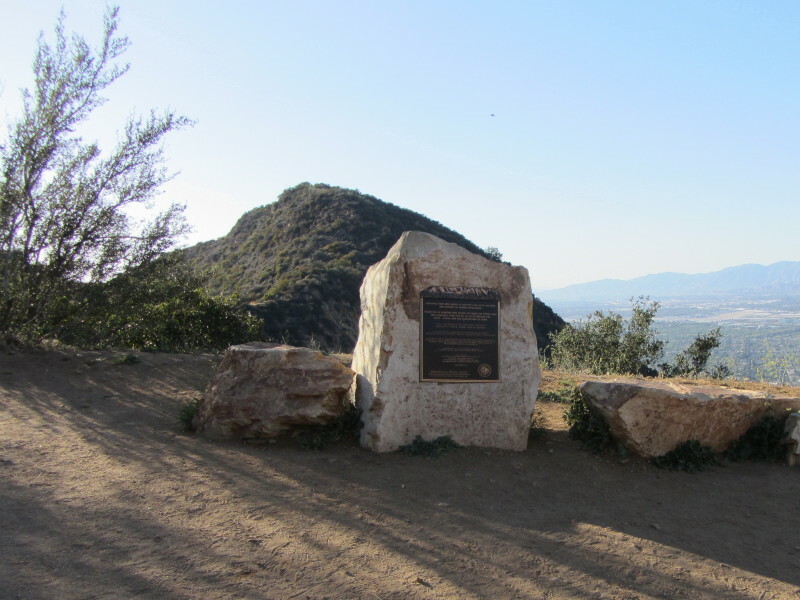 This narrow trail, dubbed as Aileen Getty Ridge Trail in 2010, will take you 0.2 mile to Cahuenga Peak (1820') and 0.6 mile to Burbank Peak (1690'), a nice side venture if you are so inclined (read my hike description for the west approach via Burnbank and Cahuenga Peak). Follow the road as it curves left and in moments you reach your destination. Below you stands the Hollywood sign at 50 feet tall and 450 feet long. On a clear day, the view of the L.A. basin can be stunning. 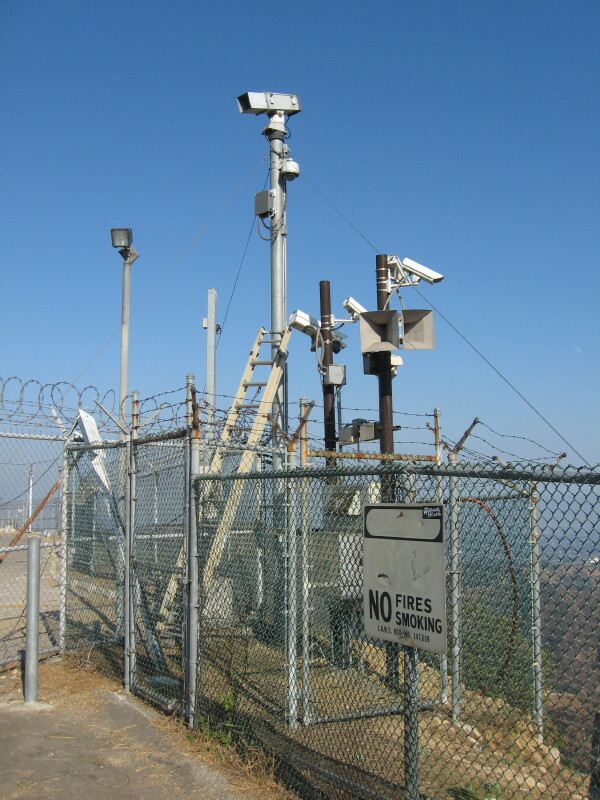 Heed the warning prohibiting access to the Hollywood signthere are human eyes watching surveillance monitors and officials are serious about enforcement. To ascend to the very top of Mt. Lee, take the path to the left of the gate and climb a few steps to the top of the knob. 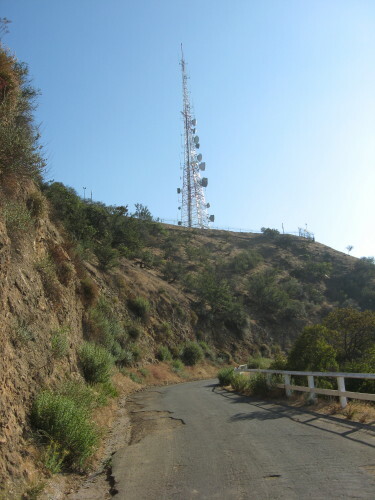 Mount Lee was named for the Don Lee Netework, which established the first transmitters on the summit in the late 1920s (read more on my description via Burbank Peak). Savor this historic site before you return the way you came. hollywoodsign.org - Office website for the Hollywood sign. Lots of interesting and helpful information...but says nothing about climbing Mt. Lee. Los Angeles County: A Day Hiker's Guide - by John McKinney (The Trailmaster, 2006). "Hollywood Sign." Historical background and good trail description. Day Hikes Around Los Angeles - by Robert Stone (Day Hikes Books: Red Lodge, 2003). Hike 64: "Mt. Lee and the 'Hollywood' sign." Brief historical background and scant trail description for a 3.0 mile hike via Hollyridge Trail. His description of the beginning of the hike is vague and confusing. His line map places Mt. Lee's summit on the wrong side of the trail. He has corrected these issues in his 2012 book (see below). This page was last updated August 3, 2015.